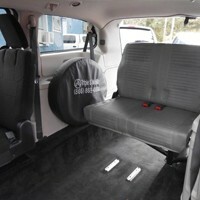 All Manual Rear Entry Dodge wheelchair vans are fully ADA Compliant and offer the reliable manual operation wheelchair access through the rear of your Dodge minivan. Not only will you get the most reliable conversion available but you will also save thousands over power wheelchair conversions. When the wheelchair user will ride as a passenger, the Triple S manual rear entry Dodge wheelchair van offers many years of service friendly and the most affordable cost. Standard on all new Manual Rear Entry Dodge wheelchair van conversions is our nationwide 5 year or 50,000 mile warranty for ultimate peace of mind. Designed to eliminate common problems with power conversion to offer the most reliable rear entry Dodge wheelchair van by Triple S Mobility. The manual rear entry Dodge has a lowered floor from the rear bumper forward to just behind the driver and passenger seats allowing the widest wheelchair comfortable room to be secured for the ride. With the new lowered floor in place, taller wheelchair users will have maximum head room to have typical visibility while traveling down the road. In the event the wheelchair user will remain in the chair for transportation, you will need to secure the wheelchair with tie downs in four point to safely secure both the individual and wheelchair. 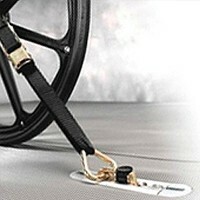 The manual rear entry Dodge comes standard with L track pods capable of securing tie downs for the wheelchair. Auto-retractable tie downs come standard with all vans and we also offer power tie downs as options. Power assisted and automatic lockdowns are also available at affordable prices. No matter the style you choose, Triple S Mobility first concern is safety and a full demonstration of both proper and non-proper methods is reviewed during your research and revisited at the time of delivery. These manual rear entry Dodge wheelchair vans offer the most versatile wheelchair users and able body positions. Capable of supporting two wheelchairs with four able body passengers and easily re-configuring with jump seating available to seat 6 when second wheelchair is not along.